Having spent only one day with the Core i7 so far, it's impossible to draw any definite conclusion at this point. Aspects such as SLI / Crossfire performance and overclocking are all extremely important and unique features to the i7 that need exploring in full, and we'd be foolish to make any comments at this time. However, based on the benchmarks seen over the previous pages one thing is for certain: the i7 eats multi-threaded applications for breakfast. Results from Cinebench and POV-Ray are simply outstanding with the i7 completing the benchmarks in a fraction of the time compared with the QX9650 and Q6600. This would seemingly make the i7 an obvious choice for professionals who regularly make use of rendering, video editing, video transcoding or even photo editing applications. Another area where the Core i7 clearly excels is in memory bandwidth. Producing results almost four times higher than the QX9650 system fitted with the same memory kit (running at the same speed no less!) and near five times higher than than the DDR2-based Q6600 system, the on-die memory controller combined with a triple-channel memory kit is clearly a winning combination. However, with all this memory bandwidth now available, it does beg the question if it will make much of a real-world difference, as switching between low and high-end DDR3 kits on existing Core2 systems yields little improvement outside of benchmarks. Moving on to gaming performance, the Core i7 once again takes the lead when benchmarked against the other stock systems. However, unlike the application benchmarks, the performance increase is less pronounced with results varying from 3FPS to anything up to 30FPS higher than the QX9650. This could well be down to poor multi-threaded coding on the part of the game developers or possibly the HD4870x2 finally becoming a bottleneck. The exact reasoning won't become clear until we can get a chance to re-run the benchmarks with dual graphics cards. • SLI vs Crossfire - Performance assessment of each multi-GPU configuration with comparisons including results from X48 and 790i chipsets. • Overclocking - Detailed analysis, how-to's and results on overclocking the i7. • i7 Gaming. Upgrade or Overclock? - With budget chips such as the E8400 being capable of hitting speeds of 4.5GHz, is the i7 a necessary upgrade, or can gamers get better performance out of their existing hardware? Be sure to look out for these articles and many upcoming reviews centred around the i7 as a base test system. However, for the moment please feel free to discuss this preview in our forums. 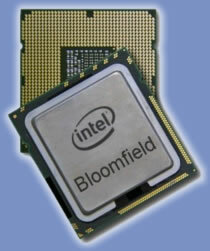 A full range of i7 CPU's and Motherboards can be found over at www.ebuyer.com.